Reston, VA. August 16, 2017- Blue Bridge Financial announced today that it has earned recognition as one of the fastest-growing private companies by Inc. Magazine on the prestigious 2017 Inc. 5000 list. “Our repeated recognition as one of the fastest growing companies in the United States is a testament to our company’s mission to fill the significant gap in small businesses access to credit. We continue to evaluate and explore ways to continue the growth of our business. Continuing to expand our origination partnerships, infrastructure, and capital providers is essential to meet the needs of the underserved $1 trillion annual equipment finance market.” stated Mark Debacker, CEO. During the Inc. 5000 measurement period, the Company has experienced 137% revenue growth. Blue Bridge Financial is an independently-owned, non-bank small business lender, a rapidly growing segment of the financial services industry, which is expected to represent almost 21% of the entire small business lending market by 2020, up from 4.3% in 2015. Since inception, it has provided over $180 million in loans to over 3,100 small businesses. To view Blue Bridge’s complete profile on the 2017 Inc. 5000 list, visit: https://www.inc.com/profile/blue-bridge-financial. Founded in 2009, Blue Bridge Financial provides flexible financing solutions for small business borrowers that are often underserved by traditional funding sources, such as banks. 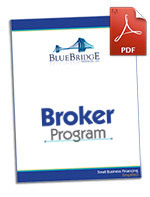 Blue Bridge Financial operates in the $1 trillion annual equipment finance industry.